The second presidential debate was a surprisingly harmonious event; that is, if you tuned in, turned the volume off, and only watched candidates silently work the room, clutching microphones onstage as if they were ready to serenade undecided voters. The event, held at Washington University in St. Louis, looked exactly like a subdued night of karaoke or amateur lounge singer night at an old school scotch bar. 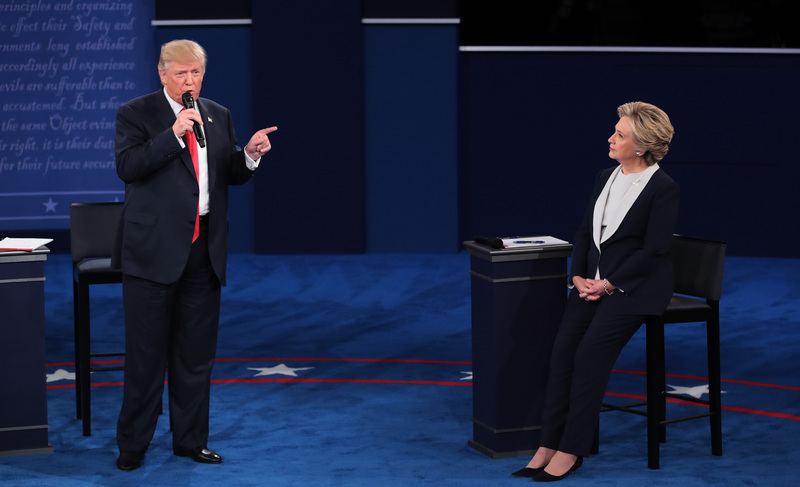 It's no wonder Hillary Clinton-Donald Trump debate duet memes were all over social media on Sunday night, allowing viewers to fill in the silence with their favorite song lyrics. Those watching the debate for its political implications were treated to a messy affair featuring the Republican nominee burying his answers in divisive rhetoric and calls to prosecute Clinton were he elected president. Clinton, for her part, occasionally threw some jabs towards Trump, all while moderators Anderson Cooper and Martha Raddatz tried to keep a handle on the town hall-style event. During the face-off, candidates answered questions from undecided voters as well as from social media users posting to sites like Facebook. In a debate that was meant to reach the common voter, but ultimately turned into a series of convoluted arguments, perhaps the only unifying thing of the entire ordeal were these duet memes. Cue those greatest hits. Pretty bold song choice but there can be only one Beyoncé. They're a little bit country. If you can get through singing this song with your primary political rival, you can get through anything. Boy, Dirty Dancing hasn't aged well. I thought they moved around a bit more than this? These lyrics may have been more coherent than the actual debate to be honest. The debate made about as much sense as the original music video for this Bonnie Tyler classic. Whose Debate Is It Anyway? Oh, so that's what they were doing onstage! And the candidates said they'd been preparing. Meh. Not the best performance I've ever seen. Trump and Clinton are the last people you could imagine rolling up to a karaoke club, ready to belt out their favorite song and ham it up onstage together. As much as Trump clearly loves the spotlight, he doesn't seem to have the range. And Clinton isn't one to hum a tune, though you can certainly give her credit for that first presidential debate shimmy. The debate concluded with the type of niceties you'd expect from a supportive room fully locked into a passionate rendition of, say, Gloria Gaynor's "I Will Survive." Undecided voter and audience member Ken Bone asked the candidates to say something nice about each other. If only they could've worked it into a song.